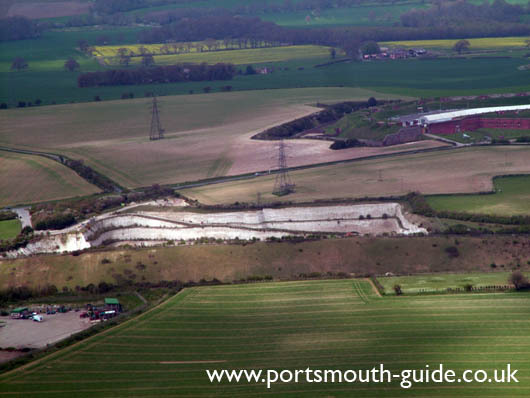 Portsdown Hill is located to the north of Portsmouth and is a chalk down that rises to 390 feet at its highest point. It runs from Havant in the East to Fareham in the west. The hill is jointly owned by Portsmouth City Council, Fareham Borough Council and the Ministry of Defence. Portsdown Hill has been a site of human occupation since prehistoric times. Burial sites have been found from neolithic, bronze age, iron age and saxon times. The hill is home to four forts, these are Fort Nelson, Fort Widley, Fort Southwick and Fort Purbrook, for more information about the forts please click here. On 11th June 1941 the City Engineer reported that he had been told to proceed with the building of civilian air-raid shelters within the chalk pits of Portsdown Hill to house 5,000 people. There were plans drawn up for two shelters; the Wymering tunnel shelter and the London Road tunnel shelter. The total length of the shelters was 1.8m and housed 5,100 people. Bunks were provided in three tiers and canteen facilities were also provided. At 9am on 19th February 1945 the Wymering Tunnel was closed with the London Road Tunnel closing shortly afterwards. The south facing area between SU618068 and SU666064 is a designated Site of Special Scientific Interest. There are over fifty hectares of SSI on Portsdown Hill. Grazing ceased in early 1950s and this lead to an increase in hawthorn, dogwood and wild privet. Large amounts of the scrub were cleared in 1995 and have been replaced with flowers and grasses. The hill is home to a wide range of plant and animal life and is well worth a visit.